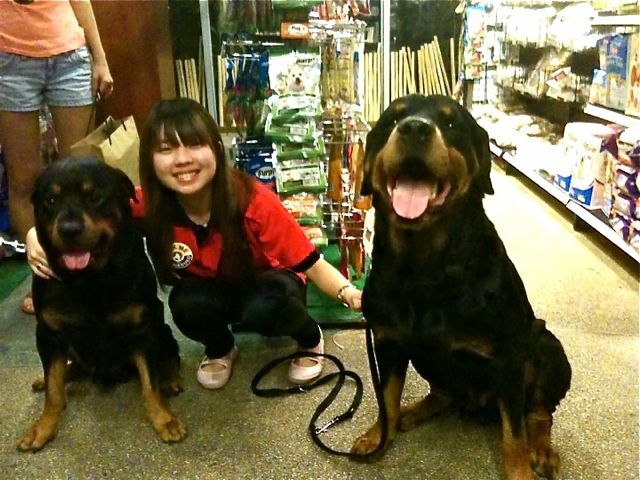 We met up with Uncle WeiXiang on Sunday to meet up with a Rotti he found wandering at Great World. She was microchipped and he actually managed to find her owner... unfortunately it was a case of abandonment. 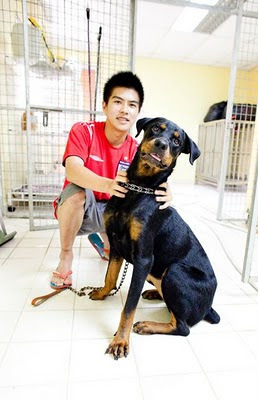 Rotty was basically thrown to him to take care of and she had a chronic tick infestation. Luckily her tests all came back great and so far Uncle WeiXiang has paid almost $1000 in both medical and board for her. She is a very sweet and intelligent girl, and Uncle WeiXiang is really upset he himself couldn't adopt her. He approached Pa about what to do, and Pa suggested that to reduce Boarding costs, Rotty should be moved to Mutts and Mittens. As a stray looking for a great home... that is a good place to go to. Uncle WeiXiang only knows Pa by reputation, so we went down to the pet shop Rotty was boarded at Clementi Road, to help transport her to her new temp home. Bruno and myself definitely tagged along. After we picked up Uncle WX and Rotty, it was not 5 mins later that he got an SMS from the shop itself, that "warned" Uncle WX that he is positively sure Pa was a breeder. Apparently, this shopkeeper was SO experienced that he told Uncle WX that Rotty was not a pure bred rotti (she is 100% is) and was in fact a mixed-breed. Hence this Shopkeeper was wrong in both counts. Irritated. After which at the pool, someone who didn't know we were Rotties called both Bruno and me FAT. We are just big boned OK? Having fun at Pet Lover's Vivo. For interested parties, please contact Wei Xiang (Contact: bokertbugger@hotmail.com for Viewing at Mutts and Mittens). It would be very much appreciated if some costs could be shared. All receipts have been kept and ready for inspection at any time. :( Will ask Nick go down and take photos this weekend, and blog about it too..! But hope she gets adopted by then too. Wtf is wrong with the clementi pet shop EXPERIENCED guy?